The Next Coen Bros. Film Might Be A Balls to The Wall Horror Film!!!! The Coen Bros. recently sat down with EMPIRE MAGAZINE for an interview on True Grit, and as usual, the Coen’s were very vague and timid, when asked about upcoming projects. I really do not know how to read that. It might be they are joking around, or they might be 11000% serious. The Coen’s usually make films they way they want to make them and which ever direction or story they want to tell. Rarely if ever, do the studios step in. I would totally be up for a Coen Bros. horror film. But their horror might just be way different than what everyone else take on horror is. The Coen’s have displayed the blood and guts and violence before on film and one hell of a scary character. 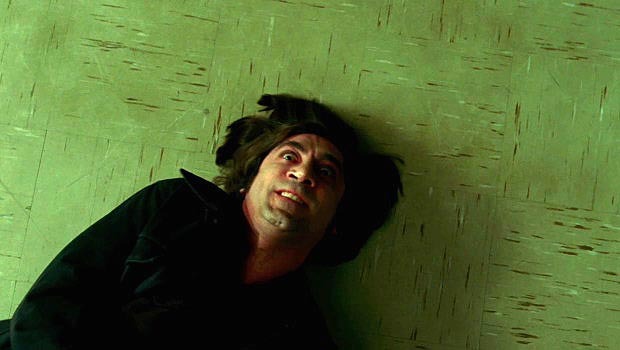 I am of course talking about Anton Chigurh played by Javier Bardem from No Country For Old Men. I’m thinking if this is true, which it may not be at all, a ghost story or haunted house story. Something like that. This entry was posted on Wednesday, February 9th, 2011 at 4:31 pm	and is filed under Film, News. You can follow any responses to this entry through the RSS 2.0 feed. You can skip to the end and leave a response. Pinging is currently not allowed. « The Sherlock Holmes Complete Collection On Bluray Announced!!! Find out the Details!! !